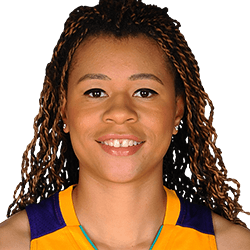 Whitney Knight (born January 09, 1993) is a guard for the Los Angeles Sparks. She played college basketball at Florida Gulf Coast. Finished FGCU career with back-to-back honors as Atlantic Sun Conf. Player of Year and three straight All-A-Sun First Team selections. All-America Hon.Mention (AP) as senior. Set A-Sun and FGCU career blocks record. 2015-16: Entered season referenced by espnW’s Graham Hays as one of five players you should go out of your way to watch. Missed first 8 games (fractured foot) but still earned Conf. POY and unanimous All-Conf. First Team acclaim after leading A-Sun in blocks and steals per game. 2014-15: A-Sun Conf. POY; First Team All-Conf., conf. tournament MVP. Nation’s only player to lead a conf.in blocks and 3PFGM. Also led conf. in points, 3PFGM, 3PFG%; paced Eagles in nearly every statistical category. Had 10 rebs, 19 pts in NCAA Trnmnt win over Okla. St.
2013-14: All-A-Sun First-Team; Eagles MVP and Def. POY. Set school season mark for blocks and became program’s career blocks leader in just second active season. Led conf. in made 3s. 2012-13:Sat out after incurring ACL injury in preseason. 2011-12: A-Sun All-Freshman Team; paced teams (No. 2 in conf.) in blocks per game. MISC: Deals with effects of asthma. Chose FGCU over Duke, North Carolina, WVU, and others.